Dom and I talked about 2D techniques over the weekend, in lab. I promised I'd do a write up of this technique. I started experimenting with it during a semester when I had both traditional painting and digital painting. I've heard from Professor Li and some other people that this is basically a digital take on a very old traditional painting technique using clay maquettes as reference, and that professional character artists (concept artists?) use basically this exact technique (ask Li for more info). I'll go through this using a screenshot of my latest project for Rigging. :-/ the breasts look like boulders and I swear it's because of a tactical harness / vest I haven't added to the character yet. To illustrate what this technique can do independent of your reference image's resolution, I'm going to make it very pixellated in Photoshop. I tend to do this anyway (with this technique) because it forces me to mix the colors sufficiently. If you smear the colors around enough to get rid of the jagged pixels, you'll probably also have a nice painterly result. It also forces you to make some artistic choices in adding the final details. Take a render or screenshot from your 3D program of choice, Zbrush, Maya, all that matters is that you have an image file to import into Corel Painter. Put some descriptive lighting on it, key and fill and a rim light perhaps and you're good to go. Open the file in Painter as normal and then make sure you have these windows open. By default, the only one you might not have open is Clone Source, which is also the most important. The Auto Clone button is what you press to have Painter do its thing and set up the underpainting for you. It's literally one button press and you're ready to put down brush strokes. 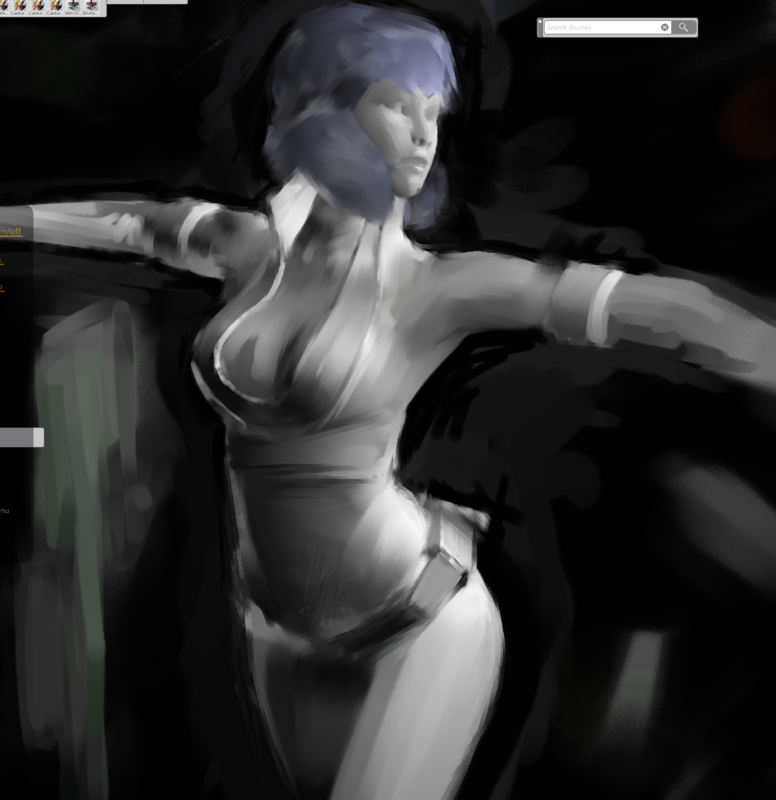 From there use the Clone Source window and its slider to adjust the visibility of the underpainting. In this mode your brush will pick up color from your reference image and place it on the canvas. No matter how visible you make the reference image, you will always pick up color from the reference image (the visibility of the underpainting doesn't affect the brush). The level of detail depends on the size of the brush. Painter seems to average the colors under the brush's footprint. Also worth noting is this "Stamp" button in the color picker. It toggles whether your brush picks up colors from the underpainting, or puts down color from the color picker. In this example image I placed some blue and purple early on so it would mix itself into the brush strokes. I've gone through nearly all of the default brushes and these are the ones I found to work the best at smearing color on the canvas. And yeah, you want more of a smear nub than a wispy hair brush. Pushing paint around is a very big part of this result. My favorite all-around brush is Wet Acrylic. I keep the underpainting barely visible, between 95 and 100%, and use the largest brush sizes possible. I saw a comment on a painting of Street Fighter characters (a long time ago) that said large brush sizes look cool because they indicate skill for being very efficient. I agree, and in my own paintings and drawings I try to achieve this large brush stroke efficiency type of look. Of course if you don't like your strokes you can Ctrl+Z so in digital painting it's a parlor trick lol. It helps to know how a painting should look. In painting class I learned that at some point you are limited by the size of your brushes and have to recognize a painting is "good and done" despite not being ultra high def like we're used to in other mediums. Otherwise you run the risk of chasing paint around for an hour even though you had a good result after the first ten minutes. These are a couple process snapshots showing the brush sizes I used, and what you might see depending on the visibility of the underpainting. With the visibility completely off, you end up with a pure painting underneath. In this first image is a view of some brush settings: Resaturation and Bleed. Those two can change the behavior of a brush somewhat, and it's worth adjusting on each of your brushes. Don't be afraid to force yourself to finish this quickly. I think it adds some energy to the painting if your strokes are quick and few, and hasty. I do a couple passes with big brushes, and then one pass with a medium sized brush for blocking the smaller details like eye sockets and shadows on the face. You end it quickly by taking a fine, sharp brush and defining around the edges of the forms. The biggest trick to this technique is messy insides, sharp edges. The vitality of this type of thing more or less depends on being messy, so don't be afraid to pull the plug and call it good. Maybe before even you think it looks presentable. the forums say the image is too big to import so I'm linking it inline. I think this is a very visceral result and to be quite honest it feels like I'm cheating somehow. But then again we have some amazing tools in the way of computer programs that were made to help us in our work. Traditional painting usually (and has for some time) involved a careful planning of objects in a scene, as well as lighting. This is no different, it's just the computer creating the light for us. As a final tip, I use images that have full black and full white in the scene, and default modeling settings usually have a similar range of values. A lot of black, actually, so I suppose I prefer the chiaroscuro look. Descriptive lighting defines the forms for the modeler and it's also good for the viewer. This has some great applications like cover art, and I'd like to use it to self-publish a graphic novel type of story. The utility of 3D models for this purpose is really worth getting excited about, I think. Model, rig, and texture an asset once and produce images over and over. It's like printing money. Plus the volume of art required for something like a graphic novel would be near impossible for one artist otherwise. Last edited by MorganD; November 9th, 2016 at 21:29.